Possessing players work to combine in 2 or fewer touches. 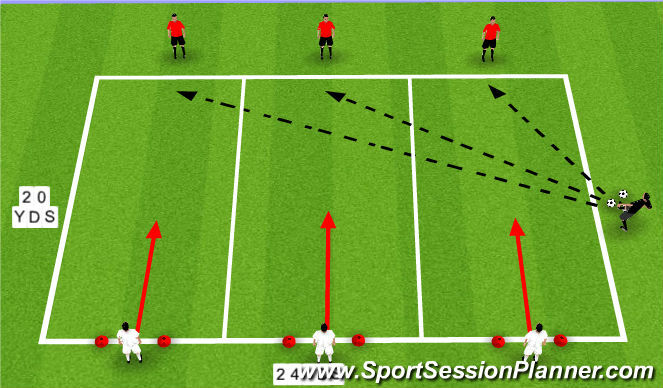 Get 1 point each time they split a pass through the 2 defenders on 1 touch. Play in 90 second intervals. Defenders do exercises for however many points they accumulated. Coach will start by playing ball out into an attacking channel and that player will go 1v1 to the goal against a defender. If the defender wins the ball he will play to an attacker in another channel and play resumes. If the attacking player scores then the next defender in that line will play out to another attacker to resume play. Emphasize: Shut down, slow down, sit down, show down defending principles. Setup: 3v2 in area 15 yds long and width of 6yd box. 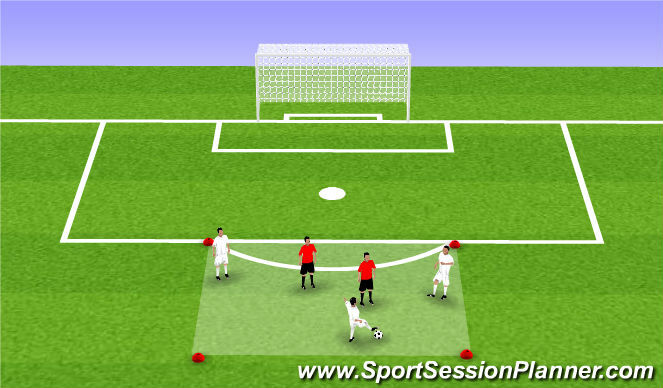 Progression 2: Play 5v3 in width of the penalty area where team goes to goal. Attackers play to goal with keeper while defenders play to 2 small goals.